One of my favorite websites to get free stuff that I adapt for therapy is DLTK Kids dot com. They have a free printable mini book for Five Little Pumpkins. They have two versions: color and black and white (which your child can color themselves!). You can print out our own copy HERE. You can also print out a different mini book of this story at Prekinders dot com HERE. 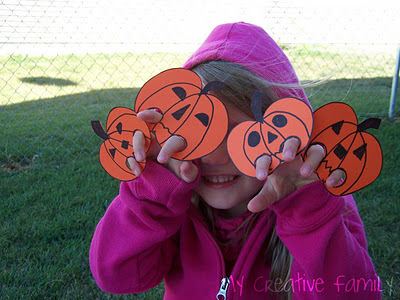 At Preschool Printablesyou will find some printable graphics (a gate and five pumpkins). They come in color or black and white. There are several different things you can do with these. Use them with just one child, or with a group of children to work on counting, vocabulary (pumpkins, witches, numbers one through five, big/small, first/last, colors) following directions, answering “wh” questions, answering yes/no questions, etc. Another fun activity can be to make finger puppets to act out the story. There are a few different ways to do this. First this is an ADORABLE craft by Craft Jr. dot com that I think E and I will do this week!! 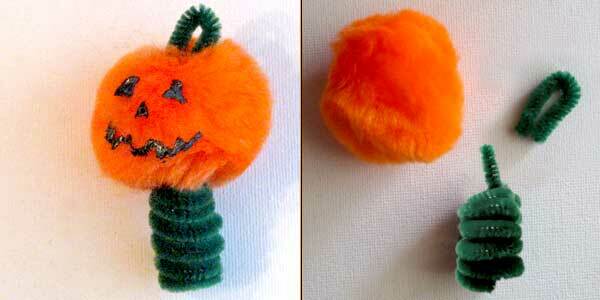 They have several different Halloween finger puppets here…as well as other fun crafts. 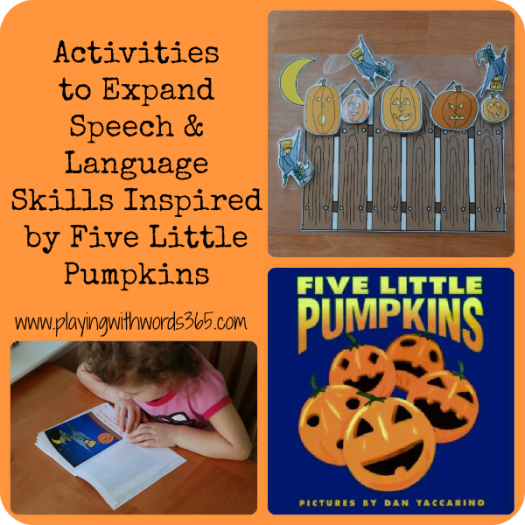 You can make 5 of them for the Five Little Pumpkins story! Another great finger puppet activity you need to check out is from Creative Family Fun. Get yourself five REAL pumpkins (I suggest of the small variety) and put them on your “gate” (real or fake). You can draw or paint faces on them, carve them, etc. Get pumpkins in different colors and sizes, and you can talk about the colors, the size (big/medium/small, biggest vs smallest, have the child put them in order from biggest to smallest). When you draw faces on, you can talk about shapes (i.e. triangles for eyes, circle for nose, cresent for mouth, rectangle for teeth, etc). First, a fun, simple (and messy!) 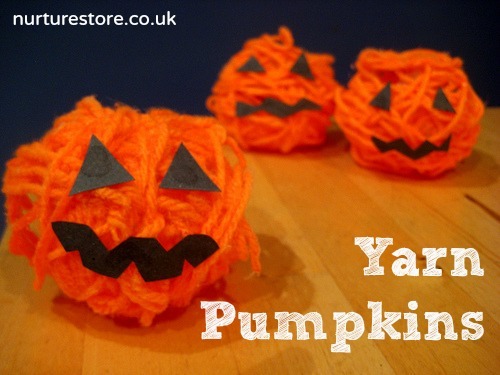 one from Nurture Store: Yarn Pumpkins. 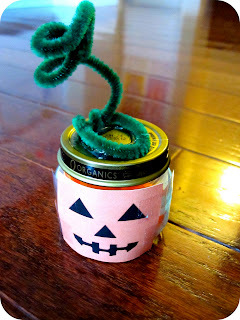 Next, check out this simple and great way to use your old baby food jars from Toddler Approved. Make sure to check out her post for many other ideas to go along with this book. 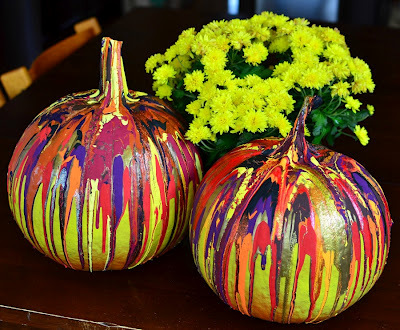 And lastly, can you believe how cool these painted pumpkins are from In Lieu of Preschool?? 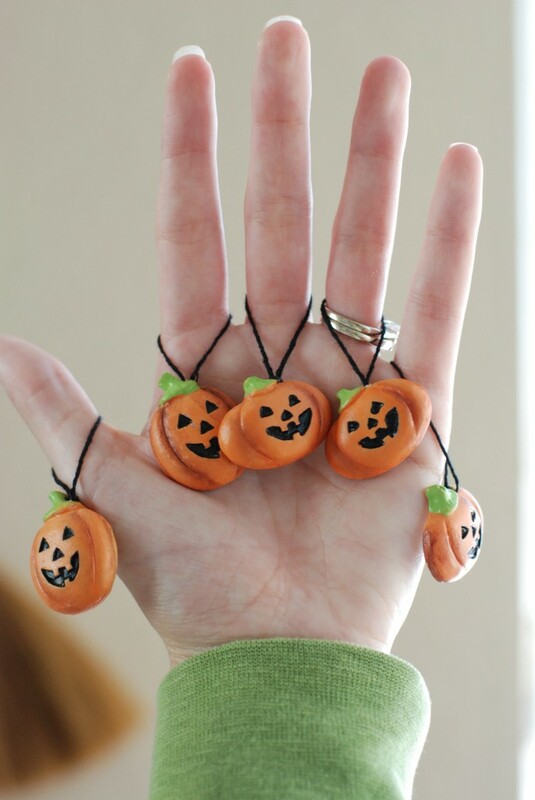 You could use mini pumpkins and do 5 of them to keep with the 5 Little Pumpkins Theme. Talk with your child all about pumpkins! Here are a couple resources for pumpkin facts. Talk about each step when making a mini book, or doing a craft (i.e. “First we are going to cut out the pages, then we are going to staple them together…”). When you are done, review what you JUST did! See if your child can recall some of the steps. I suppose we just as easily could have made a granny pumpkin, but I didn’t get around to that. I LOVE the variety of finge rpuppets you made, I’ll have to try the pipecleaners sometime. Katie, Thank you so much for these ideas. I can’t wait to use some of your ideas in therapy this week and at home with my boys.